These documents are provided as Adobe Acrobat (.pdf) files. Adobe Acrobat Reader is available free of charge from Adobe's website. Download Acrobat Reader. The Centre produces "Influenza Updates", a periodic newsletter for National Influenza Centres and submitting laboratories. 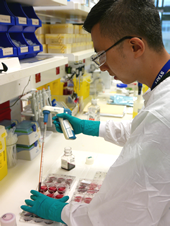 The newsletter provides information on activities, services and resources at the Centre, as well as aiming to reflect the important role played by contributing laboratories in influenza surveillance. Previous editions of Influenza Updates can be found below, please contact us at whoflu@influenzacentre.org if you wish to be added to the email distribution list.